November 11, 2018, 1:30 p.m.
Los Angeles, CA (November 6, 2018)—Continuing its role as the only Equity theatre company dedicated exclusively to developing new work by Native American artists, Native Voices at the Autry presents its eigth annual Short Play Festival: Food! Held during the Autry Museum of the American West’s American Indian Arts Marketplace on Sunday, November 11, 2018, the event features new short plays by Native American playwrights that pose the question: What’s on the table in Indian Country? The playwrights consider food an important cultural expression not unlike music or dance. Their theatrical works explore food themes as simple as what’s served for dinner, as complicated as the legacy of frybread, or as devastating as water shortages and climate change on subsistence hunting. The scripts, which were selected by a national panel, will be workshopped and read by the Native Voices Artists Ensemble. The plays are then considered for the Von Marie Atchley Excellence in Playwriting Award, a $1,000 cash prize based on the creative use of the competition theme, originality, theatricality, execution, and audience response. "Native Voices Annual Short Play Festival is always a joyful event and this year’s offerings promise to conjure up lots of memories and a little bit of an appetite," says Jean Bruce Scott, Producing Executive Director of Native Voices. "The theme, FOOD!, has made us all hungry for family traditions, recipes, and favorite dishes. 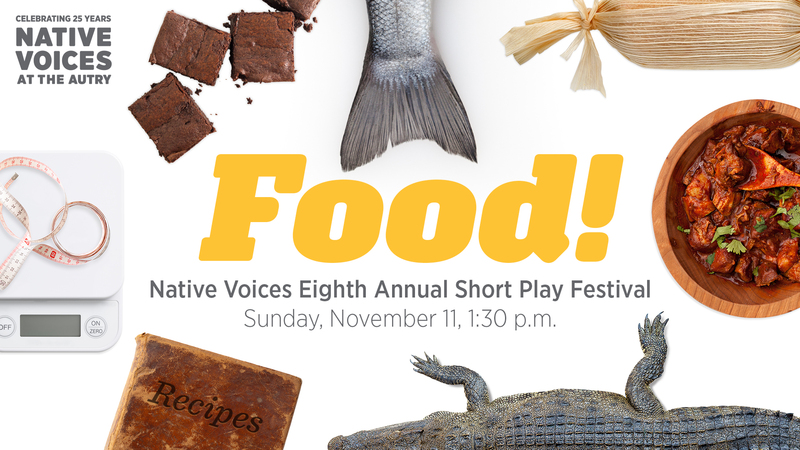 Red chile stew, fresh crab and salmon, frybread and chumuth, tamales, and three sisters salad figure prominently in these short plays. The plays also explore racism, overcoming addiction and adversity, the loss of loved ones, the maturation of college students, and the love of parents and grandparents. It’s a recipe for an exceptional afternoon of theatre featuring more than forty Native theatre artists on stage and behind the scenes." The Short Play Festival is included with admission to the Marketplace (free for Autry members; $14 adults; free for active military personnel and military; $10 students and seniors; $6 children ages 3–12). Seating for the Short Play Festival is limited, and early arrival is suggested. Nine-year-old Jo can't resist a dare but her older sister knows that words can be a recipe for disaster...until the tamale man helps her use them to discover her own bravery. Patric Verrone (Osage, Kiowa) is an emerging writer and theatrical artist and graduate of Harvard College. His plays have been workshopped and produced at the Blank Theater in Los Angeles and the Custom Made Theater in San Francisco. He researched under Michael Bronski for an upcoming anthology of LGBTQ historical essays and is also working on a novel about Scipio Africanus. As a queer mixed race (Osage and Kiowa, Black, and white) artist, Verrone uses writing to explore underrepresented facets of American culture. In the midst of a weight loss challenge, women working at a Native American cultural center discover what binds them together rather than what tears them apart. Claude Jackson, Jr. (Gila River Indian Community) co-wrote, co-produced, and co-directed the full-length feature film, In Circles. He’s written plays, such as They Shoot Basketballs, Don't They? ; Waiting for H2O; and The Unborn of the Future Nation. Jackson is also the managing attorney for his Tribe's public defender's office. Jimmy and Anna grapple with the loss of their grandmother and regret not learning her recipes when she was alive. How do we connect to what we've lost forever? Ellen Shamas-Brandt (Chickasaw) was born in Oklahoma and currently resides in Colorado. She is an enrolled member of the Chickasaw Nation and has been awarded scholarships, grants, and an honor stole. A musician, actor, and musical director, she has been involved in over 35 productions. She earned a B.M. (University of Colorado), a M.Ed. (Vanderbilt University), and a Ph.D. (University of Colorado). Shamas-Brandt has written for Child, Early Education and Development and Education Review. A young man brings his unannounced vegan fiancée home to the Everglades for a Christmas dinner that features family secrets and a surprise dish…that tastes a lot like chicken. Montana Cypress (Miccosukee Tribe of Indians of Florida) is a Los Angeles based actor/playwright originally from the Miccosukee Tribe located in Florida. Aside from playwriting, he produces and writes short films that have premiered around the country. He is pleased to present A Christmas in Ochopee, which has been one of his most enjoyable experiences writing. It's Parents’ Weekend, and students at the Native American Cultural Center host a successful potluck ...until an unexpected dessert causes chaos. Deborah Taffa (Laguna Pueblo and Quechan - Yuma) is a member of the Yuma Nation and a recognized descendant of Laguna Pueblo. She teaches creative writing at Webster and Washington University in Saint Louis. A graduate of the University of Iowa's MFA program, she writes for Stratigraphic Productions and the series, America from the Ground Up, on PBS. As a Missouri Humanities Council board member, she works with the state’s Native American Heritage Program. Her writing has appeared in The Huff Post and Salon, among other places. When Harlan comes home with his new girlfriend, he finds himself the middle-man in a Pueblo Red Chile Stew cook-off with an old flame. Does using a pressure cooker and organic pork make you a sell-out to tribal life? James Lujan (Taos Pueblo) is a filmmaker, playwright, and educator from Taos Pueblo. He currently serves as Department Chair of Cinematic Arts and Technology at the Institute of American Indian Arts in Santa Fe, New Mexico. His play, Kino and Teresa, an adaptation of Romeo and Juliet, set in the era after the Pueblo Revolt of 1680, was produced by Native Voices at the Autry in 2005. His other produced plays include Midnight Society and Casi Hermanos (co-written with Ramon Flores). Memories of events are not always the same, especially for three adult siblings. Was homemade "making do" or "the best." Both feed our desire to know who we were and who we are today. LaVonne Rae Andrews (Tlingit-Raven) has appeared in Palestine, New Mexico at the Mark Taper Forum in Los Angeles; in Taking Our Lives in Ashland, Oregon; as Mother Superior in Sister Act at PacRep, Carmel, California; and in Stand-Off at HWY #37 for Native Voices at the Autry and in South Dakota. TV/residual roles include The Millers, VEEP, Banshee, Days of Our Lives, and West World. She also appeared in the recent film The Pipeline. She is an ordained minister, coauthor of Divine Dialogues, and writes a weekly spiritual column for Paso Robles Press and Atascadero News, California. The Actors’ Equity Foundation, Department of Cultural Affairs (City of Los Angeles), Edison International, Los Angeles County Arts Commission, National Endowment for the Arts, The Nissan Foundation, San Manuel Band of Mission Indians, Seven Post Private Investment Office, Shubert Foundation, SoCal Gas, Sony Pictures Entertainment, and The Walt Disney Company. Native Voices at the Autry is the only Equity theatre company devoted exclusively to developing and producing new works for the stage by Native American, Alaska Native, and First Nations playwrights. Founded in 1994 by Producing Artistic Director Randy Reinholz (Choctaw) and Producing Executive Director Jean Bruce Scott, Native Voices became the resident theatre company at the Autry in 1999. The company provides a supportive, collaborative setting for Native theatre artists from across North America. In 2014 the company established the Native Voices Artists Ensemble to more fully support the extraordinary talents of its Native actors, writers, musicians, and directors. The Ensemble is devoted to developing new work in a collaborative process as well as supporting Native Voices’ ongoing focus on the work of individual playwrights. Native Voices is a member of Actors’ Equity Association, LA Stage Alliance, and the Dramatists Guild, and is a Constituent Theatre of Theatre Communications Group (TCG), the national organization for the American theatre. Visit TheAutry.org/NativeVoices for more information.